Take a swing at one of these nine coastal golf courses abutting the beach or bounded by marshes and maritime forests. Sailing, fishing and water sports are popular along the North Carolina coast, but golfers have also discovered it as a desirable destination from the Brunswick Islands – known as “North Carolina’s Golf Coast” – all the way up to the Outer Banks. Water flows through courses abutting the beach or bounded by marshes and maritime forests, and an ocean breeze is a constant and often unforgiving playing companion. Take a swing at any one of these nine coastal golf courses. Mounds, waving native grasses and massive waste bunkers dynamically frame a Tim Cate creation that is visually stunning and delivers a resounding golf experience. Cate’s extensive reworking of the original George Cobb design was honored as one of America’s top five renovations in 2011 by Links Magazine. Like any good Scottish-influenced links course, this Outer Banks favorite lets its prickly edges show, and relies on the steady wind off the ocean and sound for protection. 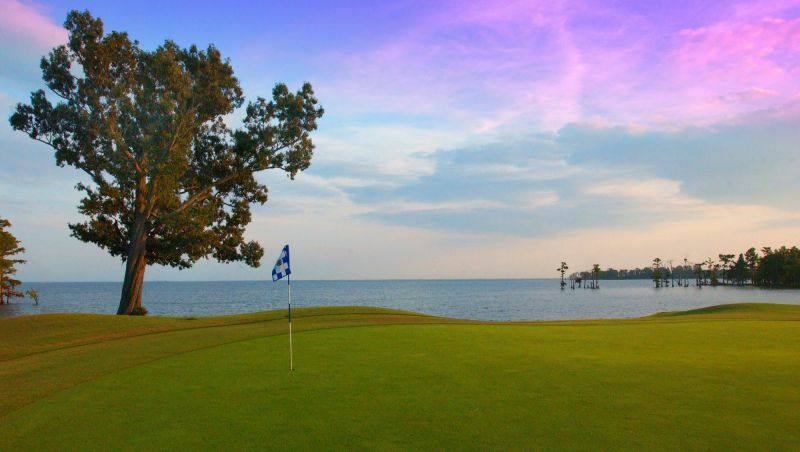 The windswept holes along the Roanoke Sound have been singled out as among the most beautiful on the East Coast – but beauty also can be a beast with tees and greens often separated by dunes, water and sea grass that require well-executed shots. This course confounds players with one of the world’s longest golf holes. The 18th plays to 767 yards and is one of the few par-6 holes in existence. The tee box for the finishing hole is actually located in South Carolina. But somewhere along the fairway, golfers traverse back across state lines to the green located in North Carolina. Both Dan Maples and Mother Nature are given credit for this coastal gem on the shores of the Albemarle Sound near historic Edenton. Winding fairways run along marshes and through groves of moss-draped cypress, with greens carefully tucked into strategic spots. The three finishing holes are not for the faint-hearted, with the entire stretch bordered by open water and swept by the wind. Built on a former hunting preserve by respected architect Willard Byrd, the meandering links-style layout is bordered by Lockwood Folly River and the Intracoastal Waterway, and close enough to the ocean to hear the surf. The club’s off-the-beaten-path location also contributes to a pleasurable and peaceful outing. This local favorite was designed by Bob Moore and claims some of the best greens in the eastern part of North Carolina. Broad, pine-lined fairways beckon, but lurking always are water and fingered bunkers. Twisted ancient oaks and tall pines frame what many players consider one of Dan Maples’ finest efforts. Though only medium in length by today’s standards, the layout demands accuracy for good scoring with well-bunkered, undulating greens the last line of defense. One testy stretch of five holes stretches along scenic Calabash Creek. Carved out by designer Rees Jones along the Currituck Sound, this rambling layout draws rave reviews from players and high rankings from influential golf pubs. This design combines a traditional approach with links-style features as it winds across coastal terrain and through a maritime forest. Both Golf Digest and Golf Magazine named Leopard’s Chase one of their "Top 10 Best New Public Courses" when it opened in 2007. The course design has made believers out of visiting players with its masterful use of natural and man-made water features, including a dramatic waterfall that fronts the steeply sloped 18th green. Gary Carter is an Asheville-based writer who covers a range of topics for magazines, online publications and blogs.